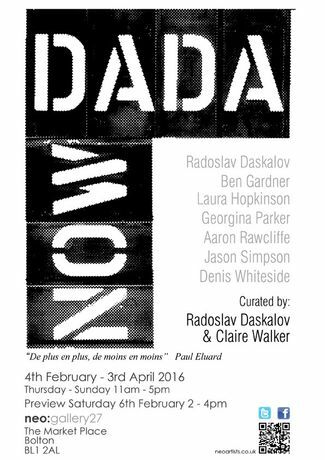 neo:studios is delighted to announce, ‘Dada Now’, a group exhibition of seven artists celebrating the centenary year of the establishment of the movement. Dada originated in Zurich but spread to many countries at the height of the First World War in 1916. It used abstract art and often childish language to ridicule the absurdity of the modern world. The first performances were put on by a group of avant-garde poets, writers and performance artists at the Cabaret Voltaire. The movement was anti-war and anarchist in nature, inspiring many later artistic and intellectual movements. The aim of this exhibition is to embrace Dada’s spirit of innovative thought and new ways of working and the artists; Radoslav Daskalov, Aaron Rawcliffe, Laura Hopkinson, Jason Simpson, Denis Whiteside, Ben Gardner, and Georgina Parker have been selected for demonstrating these qualities in their work. The group comprises of a combination of neo:studios artists, and invited artists from across the North West whose work, brought together in this exhibition, brings innovation and dynamism to the gallery. The exhibition has been organised and curated by Radoslav Daskalov and Claire Walker.